We are back again with another exciting ben 10 game! Play Ben 10 Danger from Dimension 12 game if you are a true Ben 10 fan. Billy Billions has sent the army of dangerous robots from dimension 12 to attack the city. Teamed up with Rook, Ben must destroy the robot army and save the city from destruction. Ben 10 Danger from Dimension 12 is an air-borne fighting game where Ben takes on the Billy Billions’ army. Billy Billions is a villain who first appeared in the Ben 10 Reboot tv series. As Billy attacks the city, Ben join forces with Rook on the Plumbers Airship. Recommended: Play Ben 10 Escape Route game online for Free now! 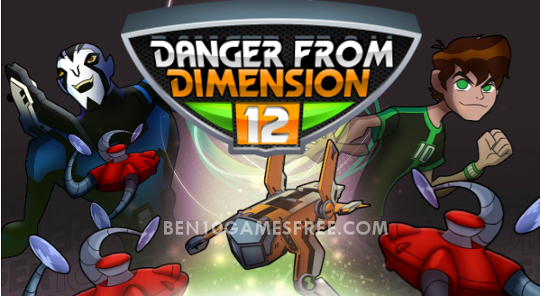 Well, before you head over to fight the robot army, you must read the gameplay to find out what are you going to face while playing Ben 10 Danger from Dimension 12 game online. This is a level-based game and each level you points that add up to your total score. The game is pretty simple to understand but not that easy to play. So better read carefully. With Rook, you are flying the plumber’s airship and the Billy Billions robots attack from all of the sides. You must attack them and destroy them into pieces. If they succeed to hit your airship, you will lose power. Pro Tip: Collect the Shield, Shockwave and other power badges to defeat the enemies easily. In the end of every level of the Ben 10 Danger from Dimension 12 game, there will a boss airship and you must destroy it complete the level. Well, that’s all. Now it’s your time to begin the fight! Teamed up with Rook, Help Ben destroy the Billy Billion’s army and save the city. Good Luck! Don’t Forget to give your rating for Ben 10 Danger from Dimension 12 game and share your tips and tricks to win this game in the comments section below.